Sassy Studio Designs has decided to have a fun 2-day blog hop - with a twist. We're allowed to use any Sassy Design and we can create whatever we want ....wait for it.....but there has to be a splash of green in it. The coolest part is if you leave some blog love, you could win the image I used in my project! Woot! Woot! Without further adieu..... That's right Princess Leia in the howsze! Not just Princess Leia, but Sassy Leia. So, wanna win her? Of course you do! Just join us for our hop - make sure you leave some love, otherwise I won't know you want to win. I'll do a random drawing and Tuesday we'll have a winnah! She's fabulous! I almost used he same papers! Love the lazer background and she's colored so beautifully! May the force always be with you! Beautiful Jodi, I love the way you colored her dress and her hair is fab. The laser background is amazing! Love the idea. Totally fab coloring as usual, too. Love this one. Our whole family loves Star Wars! WOW, this is just fabulous!! Your coloring is just amazing, and I love the laser background you created. Absolutely perfect! Jodi, Amazing card. The green works so well. Love the background and how you colored her. Awesome creation. 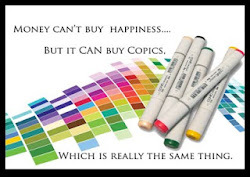 Thanks for share the copic colors you used... love your fabby coloring. Super Great Job. You definitely made Leia very sassy looking! Love your coloring and the green lazer beam shots in the background are perfect!! what a fabulous unique card!! LOve how you did the sabre's in the background! Love your card. I love the colors you used as they really pop. Thanks for sharing this. Simply fabulous card! I actually used this image for another team I am on today, and she is just so much fun to use! I love the sentiment and background you used! Well done! Gorgeous card! Your coloring is amazing, and I love the lasers you created behind Leia! 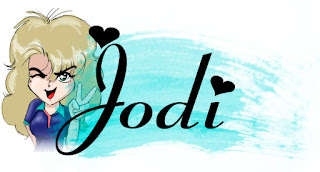 Wow, Jodi, this is AMAZING! I love that paper you used and the green lasers look so cool. My son would like this. We are also Star Wars lovers. May the force be with you.............and me. Jodi - I really love how you have colored her in this. And teh Green laser beams are a stroke of genius!!! AWESOME card...I love your coloring! 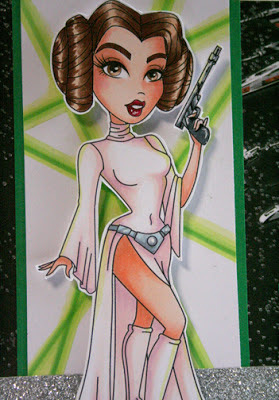 That is the sassiest Princess Leia I've seen. She is just beautiful. Jodi, all I can say is WOW!!!!!!! What a card! 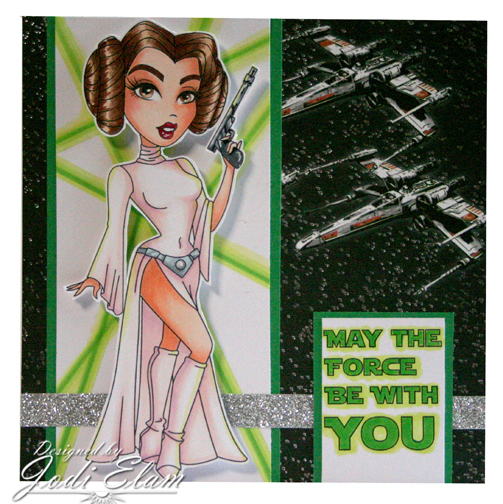 Your coloring is gorgous and I love how you did the light saber "beams". Did I say WOW??? ok, all I can say is AMAZING! Your coloring totally rocks, and that background is FAB!!!! Holy Smokes. That looks Amazing. LOve Love Love it. First off lovely coloring and that background rocks!!! 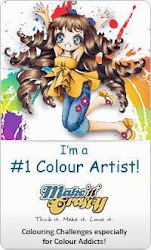 Your hair colouring technique is fabulous! Thanks for sharing! Stunning! What a Fun Card, Love it!! Great Job! WOWZA Jodi ... your coloring is AMAZING! And, I love how you've showcased this fabulous image! Thanks for inspiration! Jodi, your creation is incredibly Gorgeous!!! WOW!! AWESOME! Love the background behind Lea - looks like she's got green lasers behind her! Love it!